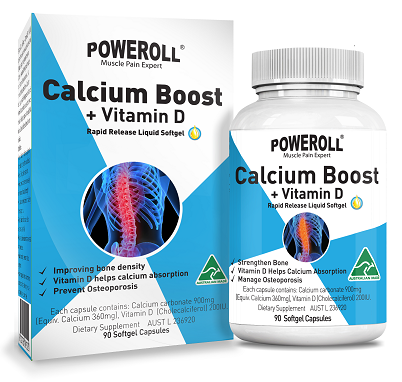 Poweroll Calcium Boost + Vitamin D3. This high potency formula combines calcium and vitamin D in doses supported by recent research. Calcium is essential for the growth, maintenance & repair of teeth and bones. It is a mineral that strengthens bone. A calcium deficiency can lead to Osteoporosis in later life. Vitamin D supports calcium absorption. As we have been limiting our exposure to sunlight, low vitamin D levels have been observed in some individuals. Source of calcium. A calcium supplement. formulated to strengthen bone and tissue. Vitamin D helps calcium absorption. It helps prevent and treat osteoporosis by improving bone density and strength. Individuals who may be at risk of or suffering from osteoporosis. Calcium can help relieve pre menstrual symptoms. Post-menopausal women and women who are pregnant or breastfeeding to ensure adequate dietary calcium intake. Adults: 1 - 3 capsules daily (with food), or as professionally prescribed. If symptoms persist consult a healthcare professional. Vitamin supplements should not replace a balanced diet. Store below 30ºC.